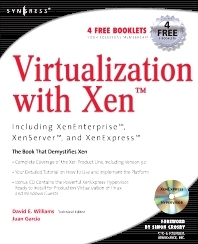 Virtualization with Xen is the first book to demonstrate to readers how to install, administer, and maintain a virtual infrastructure based on XenSource’s latest release, Xen 3.2. It discusses best practices for setting up a Xen environment correctly the first time, maximizing the utilization of server assets while taking advantage of the fastest and most secure enterprise-grade paravirtualization architecture. It covers both basic and advanced topics, such as planning and installation, physical-to-virtual migrations, virtual machine provisioning, resource management, and monitoring and troubleshooting guests and Xen hosts. Find a complete overview of the architecture model as well of all products: Xen 3.0 , Xen Express, XenServer, and Xen Enterprise. Understand the system requirements, learn installation methods, and see how to install Xen on a free Linux distribution. Learn how to use the command-line tools and the remote Java-based consoler that manages the configuration and operations of XenServer hosts and VMs. Use products like openQRM, Enomalism, and Project ConVirt to manage the VMM. Learn about workload planning and installing modified guests, unmodified guests, and Windows guests. Build a Xen Cluster, complete a XenVM migration, and discover XenVM backup and recovery solutions. See the unofficial Xen road map and what virtual infrastructure holds for tomorrow’s data center. Take a look at the different types of server virtualization, other virtual machine software available, and how they compare with Xen. Professionals familiar with virtualization and fairly experienced with both Linux and Windows-based operating systems. David E. Williams is Director of Technology Platform Services at the John H. Harland Company in Atlanta, GA. Harland is one of the leading software companies focused on financial institutions, one of the largest check printers in the country, and the leader in testing and assessment solutions for the education market. He is responsible for the operations and strategy of Windows, open systems, mainframe, storage, database, and data center technologies and services. He is also a senior architect and an advisory engineer, providing strategic direction on infrastructure for new enterprise-level projects. David is also a principal at Williams & Garcia, LLC, a consulting practice specializing in effective enterprise infrastructure solutions. He specializes in the delivery of advanced solutions for x86 and x64 environments. Focusing on cost containment and reduction of complexity, virtualization technologies have played a key role in his recommended solutions and infrastructure designs. David studied Music Engineering Technology at the University of Miami, and he holds MCSE+I, MCDBA, VCP, and CCNA certifications. When not obsessed with corporate infrastructures, he spends his time with his wife and three children.